A wonderfully versatile wool pullover with a cosy turtleneck and half-zip in a rich dark brown. The pullover is ideal for sport, riding, hiking and any other outdoors activity on cold winter days. 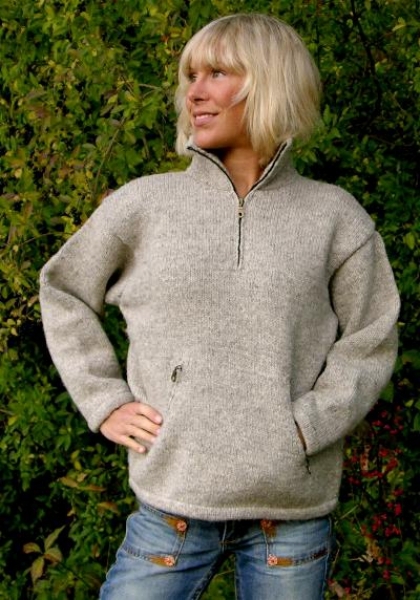 It is made of 100% undyed, unbleached natural wool and fully lined from neck to hem - including the sleeves - with soft, smooth cotton for the perfect combination of warmth and comfort. It comes with a handy pocket at the front which can be accessed from both sides. The zipper is nickel free. The pullover can be ordered as a full-zip jacket, which will be custom made for the additional cost of 10 Euros. It can also be ordered without the cotton lining at a price reduction of 10 Euros. Need longer sleeves, want a different colour? No problem! We are happy to customise your order for an extra 5 Euros.